This is my Dad, Grandmother and Uncle. The location, Tampa, Florida,1938, actually Ybor City. My grandmother had a hard but happy life. She never had much, having gone through some of the tougher economics times of this country but one thing she did have, invested in, and handed down were photographs…professional ones that she had taken with her children,family and later me whenever I visited her from New York. She had a favorite studio in Tampa, where an excellent photographer exercised the perfection in his craft,you see here. His canvas background and various chairs that appear in other photographs he took of us through the years were his only special effects, long before PhotoShop. His concentration on his view camera,lighting and his subjects all the while putting up with us and the demands of her added to the treasure chest of memories and recordings that made up her trove. Her documentation, ink, who knew? Her importance to these sessions were equally met by her photographer and maybe that is what this post is about; the importance of time, the one we take, the one we share and the one we leave for those who couldn’t be there. Some things are worth doing, unaccountable to dollars but to the love of what one does and this shows it. 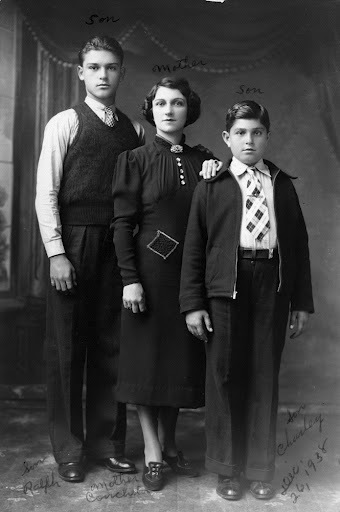 Looking at this family portrait,we see a classic Black and White of its time, perfect posing ( a little stiff by today’s standard ) perfect lighting,exposure and expression, not something that he pumped out because the next 40 were in line. This was an important moment for all. You can see he took it seriously because it was important to her, his client and him, his reputation. He didn’t measure her wallet,it wasn’t that big. He weighed his reputation and it weighed much more than whatever she could given him. This was Angelo’s Studio and the approach wasn’t about immediate money buta personal worth over the course of time. A few short years later, my dad on the left went to the Army and my uncle, the chunky one, went to the Marines, both went to war and made this image and this photographer’s skill and attention to the details much more precious to her and to those of us who will carry on. In a great scene from Spiderman, Uncle Harry turns to his nephew Peter Parker, yet to be become the super hero, and says ” With great power comes great responsibility.” Later , Peter now Spiderman, learns the depth of that statement. 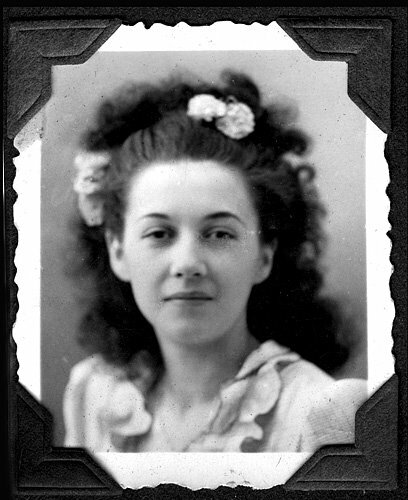 This is my mother, in her youth , right after World War ll in France. It is an honest portrait showing a strong beautiful girl not trying to project anything but her strong presence in the moment of who she is, unknown to another viewer all the experiences of World War ll that she endured during the German occupation. Technically, flawed by a cheap camera it still holds her real self, even now as an elderly lady, as I know her. It speaks for her in that moment, sure of today with no expectations of tomorrow. It is a time piece. A few years later, early 50s, arriving in New York City, a professional photographer took these next images. While they are technically perfect with all the high grade professionalism and beauty of classic photography, they are someone else that I never knew but only discovered in my teens lying in a draw.While I recognized her as my mother, this was a woman I never knew existed, or could. For all purposes, it was my mother being someone else. It doesn’t have the honesty about her but obviously it was not meant to. It was a projection of someone else. 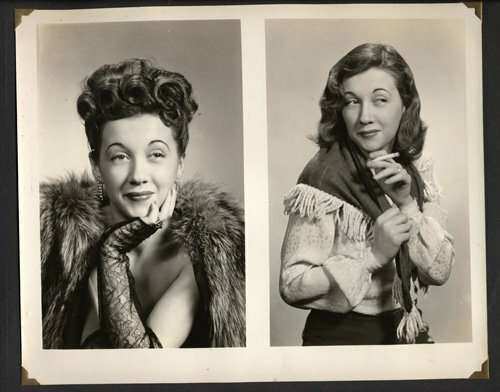 60 years ago, neither photographer probably had any knowledge of where or who these distinctly different images of the same person would wind up nor whom would view them. Luckily both had some knowledge of how to preserve them and both these time pieces endured and hopefully will continue for the future generations of my family. In a previous post I spoke of Orphan Works, a very hot item among us photographers. Luckily I knew the first photographer, my dad. The second one unfortunately is lost. I would have loved to have met him today if he is still with us just to talk about the entire series of images he made here. With his forgiveness I am showing his work here with admiration. In our possible future, images will contain an image footprint much like a finger print where no two are exactly alike, due to the digital information contained in both its metadata and the very pixels in the scan or digital file itself that make the image.This footprint would be recorded and housed so that by sending this image to that house would show me who,what and where this image came from. Were that the case,I would have been able to look him up, contact him and chatted, or at the least with whomever owns this image today. Our responsibility will lie with a serious approach of entering and registering as much info that is possible with whatever new digital programs are yet to be written. In our near future and their distant one, we and everything about what we have created will further that awesome power as long as we can further our responsibility. On the subject of Orphan Works, John Harrington, voices his opinion on his blog, well worth reading.